Natural TeaLight Candle Holder from Greek Wild Carob Tree root, Snail shape. Natural Maxi Tea Light Candle Holder from Greek Eucalyptus Tree Branch. 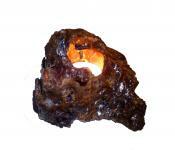 Natural Handmade Candlestick from Olivewood Root, Volcano shape. Handmade WoodenTea Light Candle Holder from Cypress Tree Root. Natural Tea Light Candle Holder from Olive Tree Root, Hill Side Shape. Natural TeaLight Candle Holder from Wild Carob Tree (Ceratonia siliqua) Branch.